Hit that hill whether it’s January or July. With Slicer you can go sledding at any time of year, with or without snow. 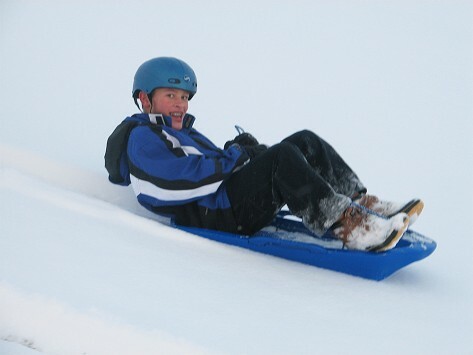 This all-season sled uses specially designed Icers for sliding down grassy slopes. Freeze them and snap them to the bottom, or store them inside the sled when not in use. Dimensions: 38.25" x 20.25" x 5.75"
Great fun! The Slicer actually really works! We received two Slicer Sleds as Christmas presents, so our first experience with the Slicer was on snow, and it worked great -- one of the best sleds on the hill. But we didn't get around to trying the Slicer out on grass until earlier this this month (at a family reunion), so I'm just writing this review now -- as I assume most are interested in whether it really does work on grass. The directions that come with the sled do say that you need the ice to be melting in order to create a slippery surface and that you need a relatively steep hill for the sled to work well on grass. That was definitely our experience, too, as our first try was on a part of the hill that wasn’t very steep (as we had younger kids that were using the sled). At first we couldn’t even get the sleds to go, but when we moved to a steeper part of the hill, the sleds went pretty well. And the more we sled the better it got, as the ice really started melting and the grass along our sled path became somewhat wet, making it quite slippery. In fact, I would have to say that by the end the Slicer was going as fast on grass as it did when we used it earlier this year on snow. Clever idea and lots of fun! Clever idea: instead of putting your sled on snow/ice, you put ice on the bottom of your sled! I mostly agree with the other reviews. Youeviews. 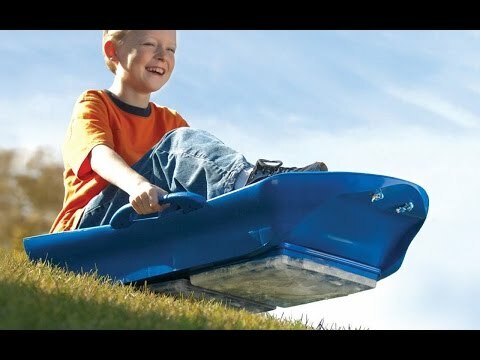 You do need a fairly steep hill for it to work well on grass-- but that's not too much different than for sledding on snow. And the lids on the ice mold containers aren't totally water tight, so you may spill a little water getting them into your freezer; and the door at the back of the sled where the ice molds are stored (when not in use) tended to flop open during sledding (which was no big deal), but other than those minor issues, there's not much to complain about -- except for perhaps the price. However, considering how solid the sled is and that you can use it year round, with or without snow, it's worth every penny in my opinion -- especially for those who rarely get snow and never get to go sledding. And for those who do regularly get snow, we've found it to be one of the better snow sleds out there. When you’re not out racing, put the Icers inside Slicer for easy storage. Next time the urge to sled hits, no matter the season, you’ll be ready.